I've been re-sighting in all the air rifles, lately, as we move from our indoor winter 10 meter air gun range to our outdoor 50 meter summer air gun range. Today, it was our HW97K Blue Laminate's turn for a long distance scope adjustment. This particular air rifle is easily one of our most consistently accurate rifles in the collection. It's one I use as a benchmark for air gun accuracy. At over 10 pounds with a scope, it is just too much for me to use an offhand rifle, so it's a bench rifle, only. Here's a sample of it's accuracy for one five shot group while adjusting the scope. After shooting this group, it reminded me of one of my biggest questions when I got back into shooting air guns, big time, a few years back, namely, this one. Are air rifles as accurate as 22 LRs at 50 yards, assuming top quality for each? And the answer is (drum roll) - both YES and NO. This is based on two full summers of shooting dozens of air guns at 50 yards and taking notes. First the YES part of the answer. Yes, a top notch air rifle can shoot as small a five shot group from a rest as a top notch 22 LR rifle can from a rest out at 50 yards, assuming we're talking a top notch 22 LR sporting rifle, not a dedicated competition bench rifle. I have several sub half inch groups at 50 yards from each of a variety of air rifles to prove it. It can be done. Before you trade in your 22 LR rifles for an air rifle for 50 yard work, though, you need to consider the NO part of the answer. To be sure, a high end air rifle is as inherently accurate as a quality 22 LR rifle, within it's range. Top of the line air rifles are every bit the precision instruments as any 22 rifle. That's not the problem. The problem is the poor ballistic potential of the projectile, namely, pellets. For my HW97K blue's preferred pellet, the H&N FTT 8.64 grain, the ballistic coefficient is a measly .017. 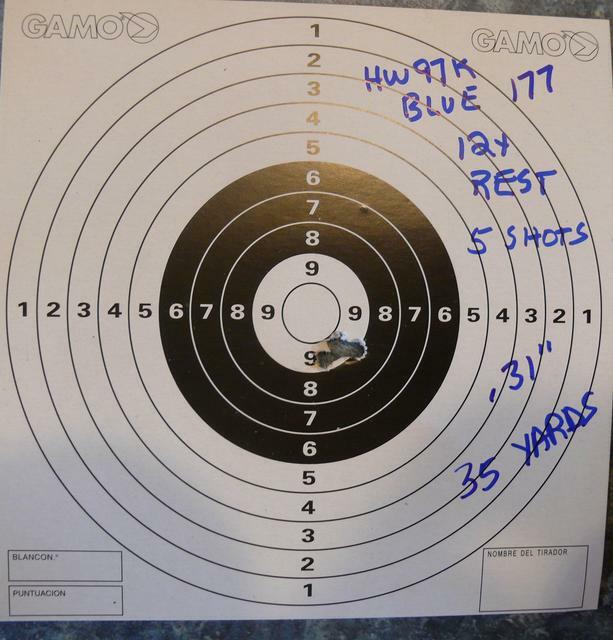 Compare that to a typical 22 LR target load with a BC of .149, almost 9 times better and you can see the problem. That miserly BC of a 177 pellet means that this pellet is extremely susceptible and sensitive to shooting conditions. In order for me to shoot a tiny group at 50 yards, I need ideal shooting conditions, as in no wind, not even a hint of breeze. I've even found that shifting air currents on a day when you can't feel any breeze and the wind flag is motionless makes a difference. To sum up, NO (and a big NO, it is), I cannot shoot those tiny groups at 50 yards with anywhere near the regularity that I can with a 22 LR. Even on a breezy day, I can shoot good groups with a 22 LR on a regular basis, and I can do it with less effort to boot. The 22 LR is perfectly at home for 50 yard work. A 177 pellet is not. So, at what distance do I find air rifles to be comparable to a 22 LR or as "at home" as a 22 LR? What distance can I expect my air rifle groups to match those 50 yard 22 LR groups on a regular, predictable basis under average shooting conditions? Back to that HW97K Blue target, above. Note the distance bottom right corner. Yup,30 to 35 yards let's me duplicate with an air rifle that 50 yard shooting with a good 22 LR, even with an 8 mph breeze, which I had with this target. That 30 to 35 yards really evens the playing field for air rifles. I consider it that ideal "at home" distance for an air rifle. In fact, I'll put up my HWK97K "Blue" against most 22 LRs for shooting small groups at 35 yards. Anyone care to try? Bring your 22 and we'll see. That HW is a fine looking air rifle. They really know how to build them. It helps to be a expert air rifle shooter also. I do alright with the old Sheridan 5MM but not as well with springers as I have a hard time trying to change the way I hold a rifle to get the most from a springer. I really like the blue laminate stock. Great shooting as always. 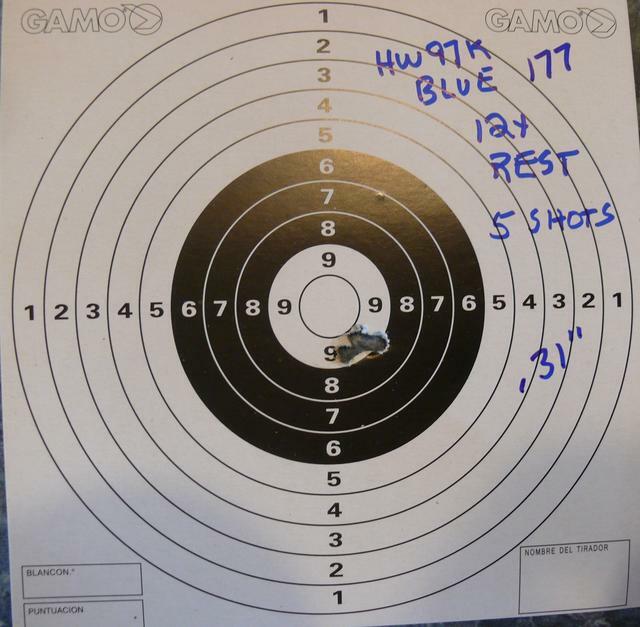 North Country Gal wrote: I'll put up my HWK97K "Blue" against most 22 LRs for shooting small groups at 35 yards. Anyone care to try? Bring your 22 and we'll see. I would but being on the other side of the world makes it a little difficult. While my bolt 22lr isn't a dedicated target rifle it does shoot almost as well. First group I ever shot with it was CCI standard and it went just over .2 @ 50. It doesn't average any where near that with cheaper ammo but feed quality target ammo like Lapua Midas+ or X-Act will go around .4 for 10 x 5 shot groups. It is a Sako Quad, I have the combo with barrels in 17HM2, 17HMR, 22lr & 22WMR, with ammo it likes it is a genuine moa rifle with all 4 barrels. I know here in Aus some of the dedicated air gunners shoot ridiculously small groups even at 100 & 200y. Some of them resort to shooting in the very early hours of the morning under spotlights in a bid to get as perfectly still conditions as possible. [/quote] I would but being on the other side of the world makes it a little difficult. Even so, if you're ever in there, please stop by for a visit. In fact, please post more about your shooting in your country. Would love to hear about. I think we all would.